It happened. I got inspired by the Kay Scarpetta countdown POST. 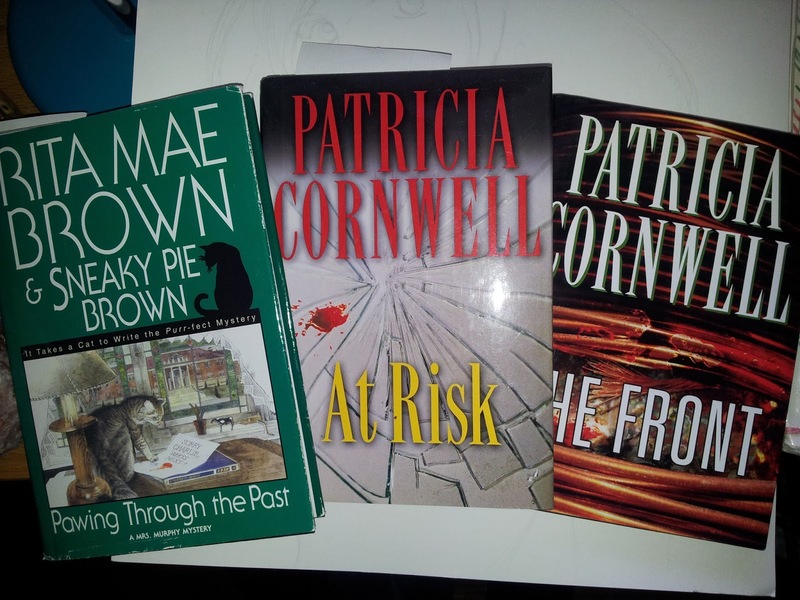 So I stepped into my library's used bookstore, and walked out with the first two–and only I presume–books in Cornwell's Win Garano series. I’ve avoided them for so long, but saw At Risk [Book 1] and The Front [Book 2] ready and available for a fair $1.50. I say fair also because, outside of Cornwell’s Kay Scarpetta series, I read the first book in her Andy Brazil series and more or less got excited for the proceeding two entries. (Owned and unread I should add.) So we’ll see how this goes. If anything, the books are so thin they should finally catch up my lagging reading challenge. GOLD. Here I am finishing book seven of Rita Mae Brown’s Mrs. Murphy series. And now I've found a nice, hardback copy of book eight. Pawing Through the Pastis begging for some attention. Man, if I can take this one down, that’ll be three Rita Mae Brown books in a month. I’m down for that. Used bookstores are the best. Let’s just say that as one.